Where do those briny green buds come from? In American culinary arts, capers are primarily a condiment, and in the Mediterranean, they are simply an ingredient, prized for their special, earthy flavor. Capers are actually the immature, dark green flower buds of the caper bush (Capparis spinosa or Capparis inermis), an ancient perennial native to the Mediterranean and some parts of Asia. Capers are most often preserved by pickling them in a brine of vinegar, salt, or wine, or by curing in salt. How Do You Use Capers? Cooking with capers is a matter of balancing their tangy, briny, pickle flavor against smooth, buttery, or velvety flavors and textures. Many recipes call for rinsing them before use to mitigate the vinegary top notes. Their unique burst of flavor makes them a favorite ingredient in uncooked dishes like salads and smoked salmon. They're also widely used in sauces, as a condiment, or as a flavorful garnish. Capers complement lemons, and they often appear together. In cooked dishes, it's best to add capers toward the end of cooking, which permits the buds to keep their shape, color, and taste. This also prevents them from becoming bitter if they're simmered too long. How Do France, Italy, and Greece Use Them? Along the Mediterranean, native wild capers have been part of local cuisines for millennia. In the South of France, tiny capers the size of petits pois are essential to the iconic Niçoise salad, and the French add capers to skate meunière with browned butter, among other dishes. Capers are in a number of delicious Italian dishes as well, from chicken piccata and veal piccata to pasta puttanesca. You'll also see capers as a traditional garnish of beef carpaccio. In Greece, capers grow larger in the rocky crags of islands and mountains, and large peeled capers the size of tiny figs take center stage in a minimalist Santorini appetizer salad of pickled caper petals in vinaigrette and nothing more. They are also in traditional Greek salads with tomatoes, cucumbers, red onion, peppers, feta, oregano, and a red wine vinaigrette, and pickled capers are worked into many a cooked tomato or fish dish. Back in the United States, capers are an essential element of bagels with nova lox and cream cheese, and they're sometimes added to chicken salad, pasta salad, potato salad, and deviled eggs. They might also appear as a delicious pizza topping, along with, for instance, mozzarella, and sliced red onions. U.S. chefs seem to go through periods when they rediscover capers. In the '90s, some chefs fried larger capers briefly in olive oil until the buds opened like crunchy flowers, then scattered them over meat and fish dishes—an innovation Julia Child admired. Of the various types of capers that are available, the most desirable may be the French nonpareils (aka "nonesuch"), which are firm and small (around 7mm or barely more than 1/4 inch in diameter) and supposedly expensive, although they're usually not more than $4 for a jar. The bigger ones can be acidic, so use them sparingly and be sure to balance out the flavors. If you're using them in a chicken or egg salad, you might want to chop them up a bit first. Capers are not the same as caperberries. While capers are the immature flower buds of the bush, caperberries are the fruit the bush produces once the buds have flowered and been fertilized. Caperberries are harvested with their stems attached like little olives, and they are cured in vinegar like capers. You can eat them whole, including the seeds, but remove the stems first. Both caperberries and capers can even go into a martini cocktail in place of the olive. And speaking of cocktails, caperberries make a terrific garnish for a Bloody Mary. 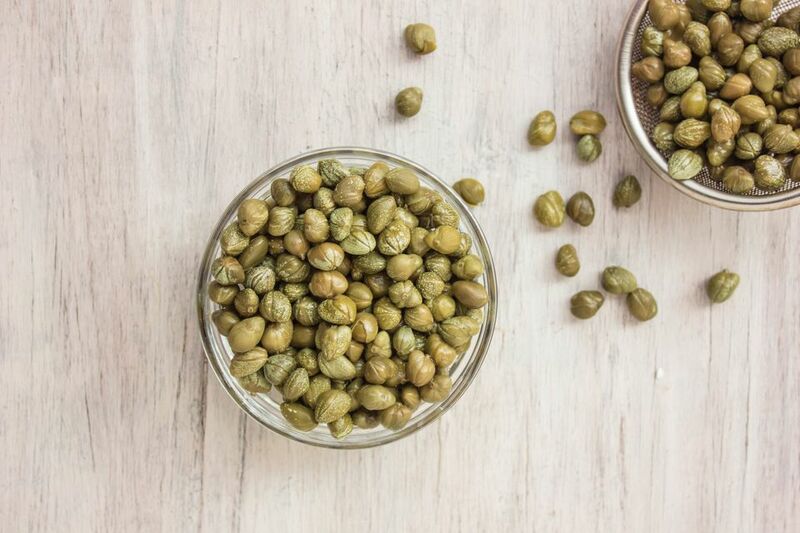 Because capers have a briny taste, you could try instead finely diced green olives or pickled nasturtium seeds.